Hieee! Sav here! Well, technically it's Savvy, though I also answer to Savvy-Sue or Little Sue. I was born near the big town of Vegas, at Blue Cedar Kennels in Nevada, and I moved to Victoria, BC when I was three months old. I live with my humans Sheri and Jonathan, and my canine siblings Ping, MoJo, Salem and Jenga. I might be the smallest in size, but I rule the roost! 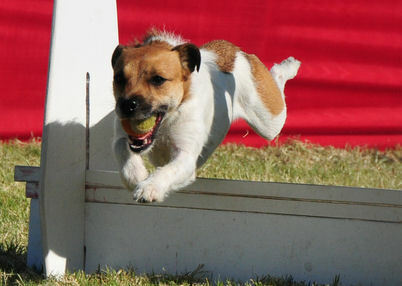 I play flyball because, well, I was born into it! Both my sire Chum and dam Snap are flyball super dogs, so when I moved in with mom, it was already expected that I would follow in their footsteps. I guess the biggest hurdle I've thrown at mom is that I like the ball above all else. I'll tug like a demon... until you bring a ball into play. I ran in my first tournament in June 2008, but returned to training until I could put it all together with confidence. Now, I can run anywhere in the pack, with any dogs, for an entire weekend; whatever you can throw at me, I take it all in stride. My average time in the pack is around 4.8 seconds, and my best time in start position has been 4.43. 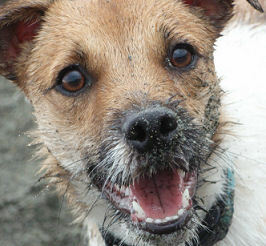 Aside from flyball, I like playing disc, fetching anything, and now we are playing this cool new sport called nose work! Oh, and one of my favourite things to do is give slappy-kisses to unsuspecting humans! My best tricks are wipe your face and kick a back leg - I often do them both at the same time!